As Josh runs for his life, he does his best to run down the truth. What he uncovers makes his blood run cold. But no one, not even the cops, will believe that he’s the latest victim of a sinister conspiracy determined to cash in on his corpse. Accidents Waiting to Happen is a novel about abuse of viatical settlements (arrangements whereby a person with a terminal illness sells their life insurance policy to a third party company for less than its mature value, in order to benefit from the proceeds while alive). They then tend to die of "accidents" rather than natural causes much sooner than expected. Protagonist Josh Michaels sold his insurance policy to the company that was killing the people who sold them policies. He makes judgement errors repeatedly; in fact, he seldom exercises good judgement. The novel is set in California, is written by a British author residing in the US, and is narrated by a Brit trying hopelessly to use a California accent. Narrator James Langton is very good but does not pull off the accent. It's not difficult to listen to; indeed, it is funny at times. 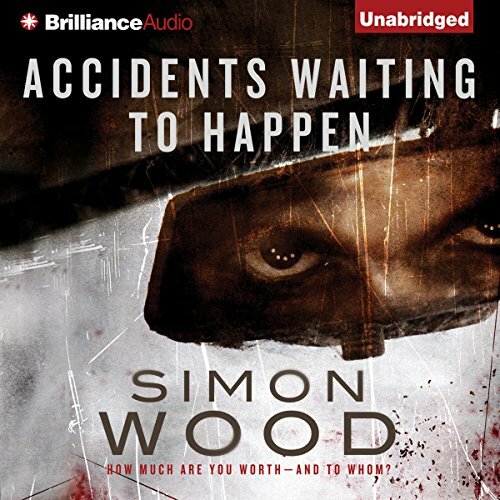 Well, Simon Wood did it again! This book had me flying by the seat of my pants. It's like seeing some really horrific picture or terrifying movie scene where you want to make it stop but at the same time you can't seem to look away because it's so morbidly fascinating in some strange way. I always ask myself why I keep reading/listening but I can't help it. His work leaves me traumatized, but in a good way lol. By the end of this one, I think I was suffering from Stockholm syndrome because I was starting to have compassion for The Professional. I wasn't crazy about Josh's wife. I can see her being upset and maybe not being able to forgive but seems like she didn't care that he was in danger. I could never guess where the author was taking me. That's one thing about his books, they are always full of surprises. The ending was AMAZING! I never expected the way this ended. I had to sit back and close my eyes for a second to let it all sink in. You will cuss, you will cry but you will also be punching the air screaming &quot;YES&quot;! If you are listening to this in audiobook form, you will love the narrator. I think he is my favorite out of all Simon's narrators. Very good at doing voices. I enjoyed the story but it really dragged along for me. Not my kind of book. Wrong narrator for a book set in California. Narrator was boring and so was book, so together it was painful to listen to. I kept listening hoping the story would at least improve, unfortunately it didn't. If I were to write a book it would probably be this bad. That's why I'm a reader and not a writer. I will be crossing this author and narrator off my list. The book was spoiled for me by the British narrator and the poor American accents given to the characters. I cannot understand why it was not read by an American narrator, this would have made more sense and added to the authenticity of the characters. Quite a good, if somewhat predictable story and I guessed the ending before I actually got to it. Anyway, I digress. This book had me hooked again from the first word uttered and I lost about three days of my life glued to my ipod listening. I won't say anything about the storyline, but if you read it, you're stomach will be in knots and you'll eye everyone you know with a new found suspicion. I have never come across an author who consistently writes great books but with enough difference in them to keep me keen. I am working my way through them all and adding each one to my library as I finish the one previous. God knows what I'll do when I've finished them all...start from the very beginning again.